This week I've nabbed two amazing freebies via the medium of Twitter... a scratching post for my cats and a trial workshop at the Make Lounge. My homemade jam and chutney suited and booted ready for Christmas. I made my first batch of homemade jam using foraged blackberries from Wick Woods a few months ago and it wasn’t half bad. 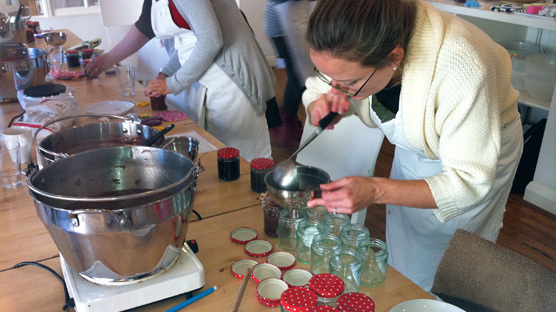 When word of a free jam and chutney making workshop at The Make Lounge popped into my Twitter feed this week, I thought it’d be interesting to see how an expert does it. 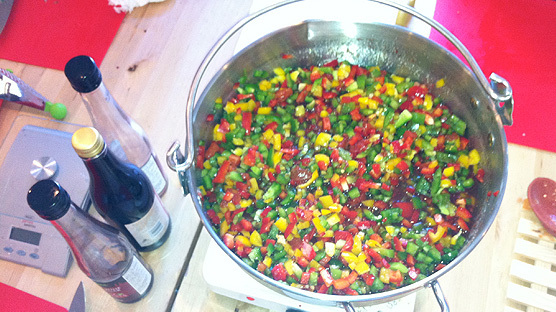 Piles and piles of peppers for our sweet chilli jam. 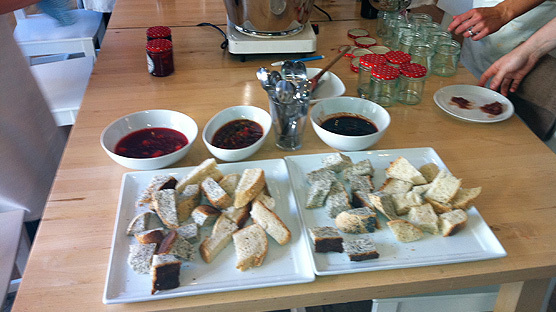 Our class of 10 worked as a whole group preparing the ingredients for four huge preserving pans to make: blackberry and apple jam; plum, cinnamon and orange jam; sweet chilli jam and a caramelised onion chutney. 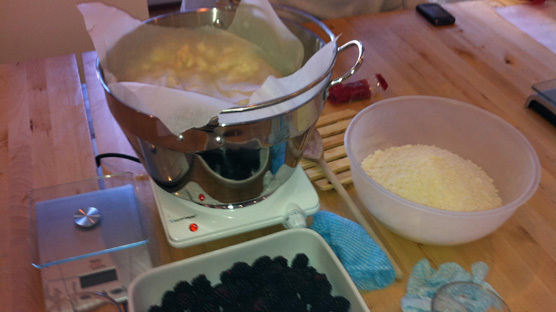 Apples and blackberries and the most sugar you've ever seen. 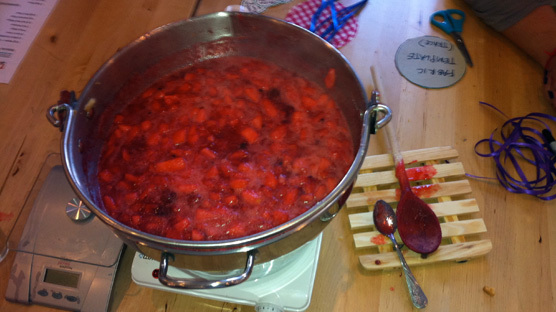 As we chopped, diced, peeled and cried (seriously strong onions) Chloe our teacher taught us all about pectin, acid, different sugars, types of fruit, bottling, storage and everything you need to know to whizz up some jam & chutney. Stewing plums smelt absolutely delicious. Once everything had been added to our pans and was bubbling away, we learnt all about the crucial setting point. An important gap in my knowledge that explained why I went wrong when I made it on my own. Upon which it was time to bottle up using special jam funnels and a steady hand. 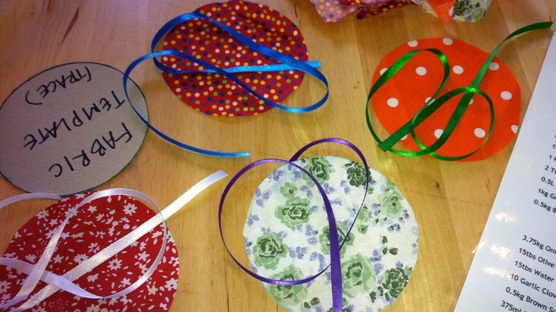 Pretty fabrics and ribbons to transform our homemade jams and chutneys into perfect presents. The finishing touch was to add a bonnet style hat to each jar using a fabric of our choice and matching ribbon. Very cute! All that was left to do was to taste the fruits of our labour spooned onto freshly baked bread. Delicious! 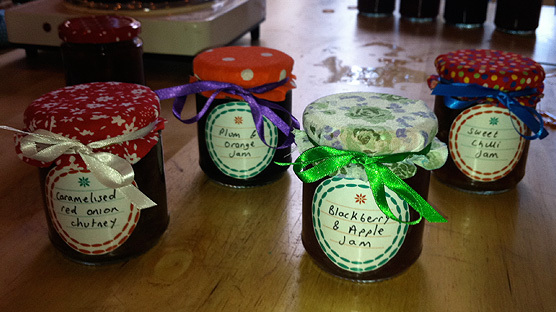 My favourite was the plum, cinnamon and orange jam – a real taste of Christmas. After the workshop I hot footed it over to fellow tweep Katie’s pad to pick up a cat scratching post that she was offering freecycle style a few days ago. I don’t think I’ve received such a flurry of freebies before, I could get used to this!